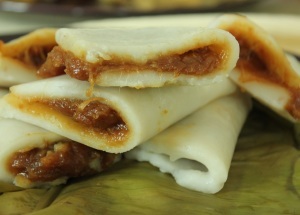 Ela Ada: Ada or Ela Ada, is a traditional Kerala delicacy, consisting of rice parcels encased in a dough made of rice flour, with sweet fillings, steamed in banana leaf and served as an evening snack or as part of breakfast. It’s a snack made out of raw rice flour, sugar or jaggery and grated coconut. It is usually prepared on Onam. Ela Ada is also given as Prasadam (Sacred Food) to devotees at temples in Kerala. Melt grated jaggery in a heavy bottom pan with three table spoons of water, on low flame. Stir it constantly to make thick syrup. Sieve the jaggery syrup into another bowl to remove any impurities. Cool the sieved jaggery syrup to room temperature. Add in the grated coconut and cumin powder to jaggery syrup. Mix well to make the filling for ela ada. Mix rice flour, salt, ghee and cardamom powder in a large mixing bowl. Pour 1/2 cup hot water in the bowl. Mix well with a wooden spatula. Allow this mix to cool slightly so that you can knead it well. Add a tablespoon of water at a time, if the dough is too hard. Divide the dough in to big lemon size balls. Place a dough ball in the centre of the banana leaf. Flatten it using your finger tips to form a thin even layer of dough. Place a tablespoon of filling (prepared earlier) on to one half of the flattened rice dough and spread it evenly. Fold the leaf in the middle and seal the edges of the dough by gently by pressing it. Repeat the process with the remaining dough. Steam the uncooked ela ada’s in a steamer or Idli cooker for 10 – 15 minutes. Switch off the flame and let the ela ada’s cool for few minutes. If you have any queries regarding the Ela Ada recipe, please leave a comment.